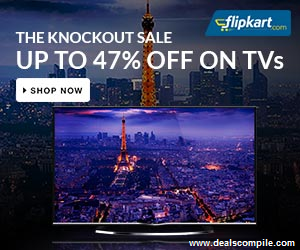 Flipkart brings to you a huge range of LED Televisions where you can get televisions at upto 45% off + upto Rs. 5000 off (Exchange) + EMI Interest Cashback. Exchange Offer:- Upto Rs. 4000 off: Click With Exchange on product page. EMI Interest Cashback: Zero downpayment and get interest component refunded as Cashback on all credit card installments (EMI) for 3 and 6 months Tenure. 6.Bravo !! Order Successfully done.